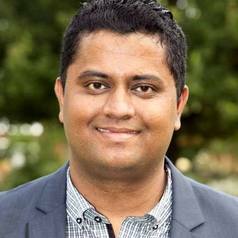 Dr Narayan is Senior Lecturer in Animal Science at the School of Science and Health based on the Hawkesbury campus, Western Sydney University. Edward graduated with a PhD degree in Biology from the University of the South Pacific and pioneered non-invasive reproductive and stress endocrinology tools for amphibians - the novel development and validation of non-invasive enzyme immunoassays for the evaluation of reproductive hormonal cycle and stress hormone responses to environmental stressors. Dr Narayan leads the Stress Lab (Comparative Physiology and Endocrinology) at the Western Sydney University's Hawkesbury Campus. Edward joined Griffith University, Queensland with successful postdoctoral fellowship in 2009. Edward initiated an innovative long-term research program based on the Conservation Physiology of wildlife. Edward's dynamic career research platform is based on the thematic areas of comparative vertebrate physiology, stress endocrinology, reproductive endocrinology, animal health and welfare, and conservation biology. Edward's research team comprising of supervised Honours, Masters and PhD students (and numerous student volunteers) have made significant new discoveries, including understanding the sub-clinical physiological impacts of the debilitating pathogenic disease (chytridiomycosis) on amphibians; the physiological impacts and fitness consequences of acute and chronic environmental stressors on amphibians. Edward has also developed non-invasive stress hormone monitoring tools for marsupials such as the Koala, Woylie and the endangered Greater Bilby. Edward has also studied the stress physiology, health and welfare of Tigers in Australian and Indian Zoos. He has extensive postdoctoral research fellowship training in institutions spanning 4 countries (New Zealand-Landcare Research), Australia (Griffith University), India (Australian Academy of Science Early Career Fellowship – University of Pune) and Canada (Department of Biomedical Sciences, University of Saskatchewan). Edward has supervised over 20 undergraduate special topics, Honours, Masters and PhD students in Australia and from overseas. Edward has published over 50 peer reviewed research in collaboration with researchers at Murdoch University, University of Melbourne, Macquarie Uni, Deakin Uni and Griffith University. He also has active on-going research collaborations internationally (e.g. India, Argentina, Vietnam, Canada, Brazil and USA). Edward also provides consultation support based on Animal Welfare related work. He currently holds membership of the Endocrine Society of Australia, International Association of Stress Physiologists, Society for Experimental Biology, Australia & New Zealand Society for Comparative Physiology and Biochemistry and International Society for Wildlife Endocrinology.